It happens to all writers sooner or later. You sit down at your typewriter to start an article, but the words won't come. You type a few lines, but they are awkward and not at all what you wanted to say. You rip that sheet of paper out and begin the whole thing all over again. But the next draft is even worse. And so it goes — more paper — more wasted effort — more frustration. Soon the floor is littered with crumpled sheets of paper, but you have made no progress at all. It is known as writer's block. You are tempted to get up and forget it, scrub the whole idea and go and do something you can do. Which is perfectly fine if you are an amateur, since nobody is depending on you and it doesn't really matter whether you write or not. But a professional writer can't permit himself the luxury of giving up. He has a deadline to meet. An editor is counting on him to provide a certain number of pages of copy, and his reputation (and perhaps his livelihood) are at stake. Not only writers experience this. Artists, composers, architects, landscapers and, indeed, most people engaged in creative pursuits suffer a block from time to time. That includes people who pray. Perhaps you have not thought of prayer as being a particularly creative activity. But it should be. Unfortunately, many people have been taught to pray "official" prayers. They learn them by heart, but usually not from the heart. They read them out of a prayer book, or repeat them from memory. After a while their prayers become habit, and they say them without thinking, or even while thinking about something else. But Jesus specifically told us not to pray like that. We should pray with our brains fully engaged, thinking carefully about what we are saying. That kind of prayer is a creative activity. It is also, unfortunately, subject from time to time to "prayer block." It happens like this. You kneel down to pray, but somehow you are not in the mood. The words won't come. Your mind drifts. You sense you are just talking to four walls, that your prayers aren't going any higher than the ceiling. "This is a waste of time," you say to yourself. You are tempted to get up, forget it and go and do something else. Which is perfectly fine for amateurs, people for whom contact with God is not a matter of life and death, or people who really have nothing important to pray about anyway. But real Christians who understand the plan of God and who want to be a part of the Kingdom of God cannot permit themselves the luxury of walking away from praying just because they don't feel like it. They are in much the same position as a professional writer with a deadline. Their prayers are needed. They are being counted on to produce. How, then, do you overcome a creative block? Writers have their tricks of the trade. Many of those methods work just as well in overcoming "prayer block." Here are four that might help you. • Persist. When things aren't going well, and the ideas just won't seem to come, the temptation for a writer to get up and simply forget the whole thing is strong. But writers who mean business will fight against that temptation. They will set themselves a goal. They will say, "Nothing or nobody is going to drag me away from this typewriter, until I have typed at least five pages." Then they get on with it. What emerges may not be the greatest prose ever written, but it is something. I have noticed that once I set my mind not to quit until those five pages are finished, things start to loosen up. After a while the words start coming and ideas begin to flow. Before I know it, I am back in creative gear, and may go well over five pages before I realize it. Try that technique with praying. Determine how long you intend to pray. Decide there and then that you will not abandon the situation until that time IS up. • Stay there. Try to pray. It may not be the greatest prayer ever, but you will at least have prayed some, and you will not have walked away from your responsibility. People who do take the easy way out, just abandoning prayer as soon as it gets difficult, find themselves praying less and less. Pretty soon, their prayers have become nothing but brief, halfhearted mutters. God doesn't take prayers like that seriously. They have joined the ranks of amateurs. • Get started. This is often a cause of writer's block. You can't seem to find the right combination of words to begin. The key here is to type something — anything. You see, the thoughts are there, and getting something down seems to unlock the brain. It is the same with praying. There are no magic words that attract God's attention. He is always ready to listen to His people. Address God by name, and then get started. If nothing else, tell God that you are having difficulty praying to Him, and ask for His assistance. He will help you (Romans 8:26). Sometimes people who have neglected prayer for a long time feel awkward and embarrassed starting again. They feel that God is angry with them, and that they have no right to take up His time. That's a very human reaction. But remember the analogy in the parable of the prodigal son (Luke 15:11-32). The son was afraid to come back. He felt he was not worthy, and was uncertain of what kind of reception he could expect. But the story says that the father saw him coming "a great way off" (verse 20). The father was looking out for him, anticipating the day of his return. We can learn from this. There is no need to feel hesitant or unworthy in getting back to God. There is no waiting period where you are a kind of second-class citizen until you have proved yourself. If what is stopping you from praying is a feeling that you have neglected prayer for too long, you are deceiving yourself. Start praying. If the thoughts are there — if you are in a sincere, humble, God-fearing attitude – the words will come. • Make an outline. I sometimes find when I am writing that I grind to a halt after a paragraph or so, because I don't have my thoughts organized. The way around this is to make an outline. It is surprising how easy it becomes to type the article all the way through then. Jesus, it seems, used an outline to pray. The disciples noticed that He could pray easily and regularly. They had been taught to pray in a more formal and ritualistic way by the religious teachers of the day. They had always assumed that was the right way because, after all, the Pharisees and Sadducees were righteous men, weren't they? Surely they knew how to pray, didn't they? No they didn't, according to Jesus (Matthew 6:7-8). He showed them how He prayed (verses 9-13). Stop for a moment and read Jesus' sample prayer. It is commonly called the Lord's Prayer. The Lord's prayer outline would be a better description, because if Jesus just prayed these words, over and over, He would have been guilty of doing what He had just said the hypocrites did. Rather, these verses are a series of topics and categories under which the many things that a Christian needs to ask God could be grouped. With this outline as a guide, you might even want to make a list. There is nothing wrong in this. It is a sensible way to remain businesslike as you pray. Businesslike? That is a strange word to use in connection with prayer, isn't it? Not really. You see, one of the strongest incentives for a professional writer to overcome writer's block is the feeling of responsibility that he has toward his editors and readers. If a writer expects to be taken seriously, he must treat the responsibility of writing seriously. "I didn't feel like writing" is no excuse for not having material ready on time. It is the same with praying. Prayer is not just a religious ritual. It is a way to get things done. 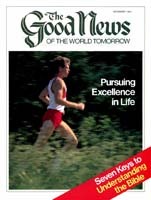 Almost certainly, if you are a regular reader of this magazine, you are interested in God's work and the welfare of God's people. Praying to God for His people and about His work makes a difference. If you shirk your responsibility, that difference is not made. If you are casual about your effort, why shouldn't God treat it casually? But if God sees that you take your contact with Him seriously, treating it as a responsibility that counts, He will listen to your prayers. And answer them! It takes thought and planning. Like a writer, you have deadlines to meet — a daily deadline, of course, and that major deadline of the coming of the Kingdom of God. Like writing, prayer can sometimes be a matter of hard work. But the results make it totally worthwhile.